Gauri Junnarkar, founder of ‘Ayurnutrition’, an integrative wellness practice in DFW, is a highly accomplished Registered Licensed Dietitian/Nutritionist, Certified Diabetes Educator, Ayurveda Practitioner, Panchakarma Specialist, and Licensed Massage Therapist. Gauri earned her Bachelor’s degree in Ayurveda from the University of Mumbai. She also holds a Master of Science degree in Nutrition from Texas Woman’s University. She has completed a 500 hour Massage Certification course from Kekino Massage Academy. She is currently licensed as a Massage Therapist in the State of Texas. Gauri has more than 14 years’ experience in the field of Ayurveda. She is a dedicated nutrition professional with 9+ years’ experience as registered/licensed Dietitian and 6+ years’ experience as a certified diabetes educator. 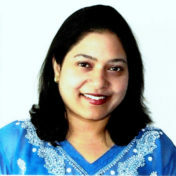 Gauri’s expertise includes Nutrition, Diabetes education, Ayurveda, Panchakarma and Massage Therapy. She integrates Ayurveda principles with Nutrition in her daily practice. She provides Ayurveda & Nutrition consults, Ayurvedic Massage and therapies, workshops, cooking classes, presentations, webinars, lunch and learns and grocery store healthy food tours. She teaches nutrition courses to undergraduate students at Tarrant County College and has worked as a Certified Diabetes Educator at diabetes center in Dallas Fort Worth area. To New WE Members One Time Discount: $10 off 90 minute Ayurvedic Abhyanga Massage and 15 minute clarity call regarding how Ayurnutrition can support your health & wellness needs. No cash Value, cannot be combined with any other offer. To all WE Members: $10 off 90 minute Ayurvedic Abhyanga Massage and one 15 minute clarity call regarding how Ayurnutrition can support your health & wellness needs. No cash Value, cannot be combined with any other offer. To WE Member Referrals: One time only offer: $10 off 90 minute Ayurvedic Abhyanga Massage and 15 minute clarity call regarding how Ayurnutrition can support your health & wellness needs.No cash value. Cannot be combined with any other offer.